This one was described to me as “pants-shittingly” scary and I’m happy to report that I emerged from the experience high and dry. But it’s not a flop, either. 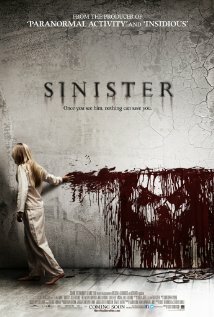 Despite some really uneven pacing, Sinister registers on the high-voltage jump-scare meter, though you can see most of them coming a mile away. True-crime author Ellison Oswalt (Ethan Hawke) recklessly moves his wife and two children into a house where a family murder/suicide took place in the not-too-distant past so he can write a book about it. (Frankly, this is another case of the protagonist being such a selfish prick that all the bad things that happen subsequently can be laid at his stupid feet. He doesn’t even bother to tell his rather dim wife about the house’s history till it’s far too late.) He discovers some disturbing home movies in the attic and begins to piece together the biggest story of his career—ritual serial killing that dates back several decades, with the killer(s) in thrall to an obscure Babylonian deity named Bughuul. The pacing problems in Sinister I refer to earlier can be attributed to way, way too many scenes of Oswalt wandering through his house at night. Sometimes something happens, sometimes it doesn’t. But I felt like writer/director Scott Derrickson’s (The Exorcism of Emily Rose) decision to spend three-quarters of the movie skulking around in low light waiting for the scary face to emerge, wasn’t the most inspired. The lack of contrast in scene after scene becomes an irritant. Still, the occult concept is well-executed and profoundly creepy as Oswalt slowly comes to the realization that his ego has caused him to step foolishly into an inescapable trap—even as he can’t help but be impressed by its horrible shape and grandeur. Parisian robbers on the run pick the absolute worst place in the universe to hide out. Frontier(s) writer-director Xavier Gens was obviously smitten with genre classics like The Texas Chainsaw Massacre and The Hills Have Eyes, but I suspect there’s a sneaky tip of the beret to French New Wave provocateur Jean-Luc Godard, as well. See? I studied film. A quartet of reasonably attractive thieves flees the political turmoil and violent protests in Paris for the anonymity of the French countryside in order to count their loot. Sidebar: What could people in Paris be upset about? You live in Paris! Have another creamy pastry and wash it down with some fine wine. Sheesh! Unwilling accomplice Yasmine (Karina Testa) and her three coconspirators decide to hole up in a bed and breakfast/pig farm staffed by Cannibal Nazi Hillbillies (Canazibillies?) and are soon horrified to find themselves on the menu. The Canazibillies have little trouble subduing the brash bandits, but then old resentments boil over during the divvying of the spoils and the Master Racists are reduced to fighting amongst each other. Even as Paris is awash in violence after the election of a right-wing candidate, Yasmine and her friends use the opportunity to commit robbery, preferring cold, hard cash to either side of a political demonstration. I believe it is their cynical lack of commitment to a cause that makes them suitable candidates for torture and a trip to the pantry. What happens when shameless opportunists meet fanatical sadists? Well, it ain’t pretty that’s for sure. Even if the revolutionary subtext is stretched thin to the point of invisibility, Frontier(s) provides effective shocks to the system with frantic regularity as captor and captive alike meet a succession of grim fates. Perhaps Gens is pointing out that the fruit born of violence, whether calculated or chaotic, is equally bitter and deadly. Don’t worry, this won’t be on the test. This is a well-made film. 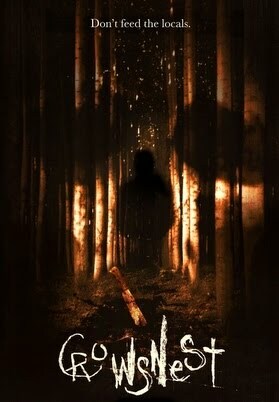 It’s The Blair Witch Project set in the Yukon and the tension build is exquisite. Sure, there’s no monster and no killing for most of the movie’s 86-minute running time, but the slow changes that occur, the gathering darkness that descends on a hapless film crew in search of the legendary Frankenstein’s monster is expertly handled by writer-director Andrew Weiner. 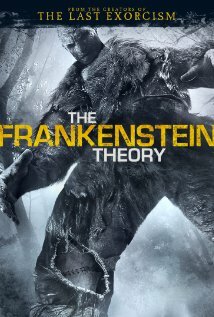 Brainiac scientist Jonathan Venkenhein (Kris Lemche, who is excellent) enlists filmmaker Heather Stephens (Vicky Stephens) and her three-man documentary crew to follow him to the Arctic Circle in search of Frankenstein’s monster, a fictional construct that Venkenhein believes to be flesh and blood. He produces letters, maps, drawings, and all sorts of theoretical evidence that gets laughed off by the film crew and their hardboiled guide (Timothy V. Murphy), but as the team gets closer to the frozen heart of nowhere, they begin to realize that there might be something to the mad doctor’s hypothesis after all. The Frankenstein Theory is a slow turn of the screw, but worth your patience. Action fans might be distressed by the lack of a towering body count, but in doling out the frights in small measures, Weiner makes the anticipation of a showdown worth savoring. As with most mockumentary/found footage features, there are improbable scenes of “anonymous” camera work (i.e., “Hey, who’s shooting this sequence?”) that stretch credulity to the breaking point, but I’m going to let it pass. Hell, I would watch this again, and that’s something you don’t hear me say very often. Another found-footage cautionary tale about the dangers of a rural partytime weekend with your buds. Seriously! It sounds like a good idea on paper, especially, as in this case, if the hot-girl-to-dude ratio is 3:2. But just look at what can happen! And if you must roister in the wilderness, for the love of gawd, don’t videotape every moment along the way. To be fair, this doomed crew has a better excuse to shoot endless footage of their misadventures than most (documenting evidence of a crime), but it’s become apparent to me that one look through the cursed viewfinder is enough to cook your goose. A quintet of assholes (really, is it too much to ask that our protagonists have at least one or two attributes that aren’t thoroughly annoying?) pile into their four-wheel drive for a roadtrip to a remote cabin. Needless to say, they never arrive, because the dudes brilliantly decide to take a detour to the middle of nowhere (Canada? Upstate New York? Can’t remember. It ain’t important.) so they can buy a bunch of half-priced beer. Seems like a solid plan until they find themselves pursued by a pack of cannibals in a Winnebago. Yep. Hungry, hungry hillbillies. The camera gets passed around from one victim to the next, followed by the inevitable chaotic, shaky handheld footage as the unfortunates get chased through the tall timber by mostly unseen predators looking to restock their larders. After all, winter’s coming. Crowsnest contains some genuinely grueling scenes of savagery, and the gradual decay of trust and friendship amongst the assholes is effectively documented. It’s a fairly slow journey into terror, but once you’re there the blood and guts come pouring down in buckets. Writer John Sheppard and director Brenton Spencer aren’t reinventing the wheel here; they’re just reemphasizing a lesson we know all too well. A carload of attractive jerks doesn’t stand a chance out there.